There are some great companies in the Berkshire Hathaway portfolio, but the next ones to get cut could be Monsanto, Axalta Coatings, and Wal-Mart. Warren Buffett is well known for having a penchant for buying and holding stocks over a long time. It was Buffett who said that his favorite holding period is forever. That said, both he and his lieutenants at Berkshire Hathaway (NYSE:BRK-A) (NYSE:BRK-B) aren't completely averse to selling stocks when their investment thesis doesn't hold up. Since the Berkshire portfolio is typically a place where investors get ideas for their next stocks to buy, we asked three of our contributors to highlight a stock in the Berkshire Hathaway universe that might be the next stock it sells. Here's why they think Monsanto (NYSE:MON), Axalta Coating Systems (NYSE:AXTA), and Wal-Mart (NYSE:WMT) might be next on the chopping block. Tyler Crowe (Monsanto): If it were any other time, Monsanto would be the kind of stock Buffett would like to hold on to for a long time. While agriculture is a cyclical industry, it is a business that is hard to disrupt, fills an essential need, and requires constant improvement as arable land continues to decline globally. Monsanto's seeds business and its new climate-modeling developments play a critical role in increasing yields, meaning farmers get more bang for their buck. That value proposition for farmers is what makes the company so profitable. For more than a decade, Monsanto has produced remarkable returns on equity. 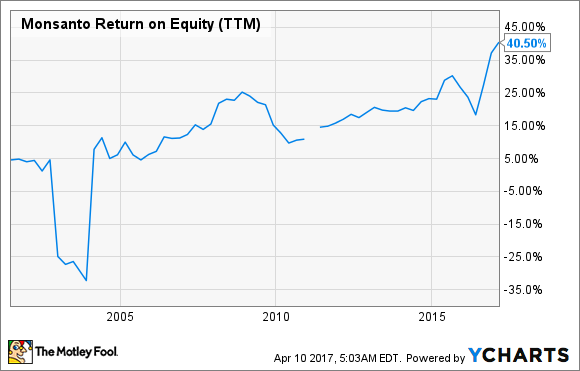 MON Return on Equity (TTM) data by YCharts. The thing that makes this situation unique, though, is that German company Bayer has offered to acquire Monsanto. The deal from Bayer is an all-cash offer. So, even those owners of Monsanto's stock today won't see their positions roll over into the combined company. Berkshire Hathaway did just pick up shares back in the fourth quarter of 2016, well after the Bayer announcement. At the time the investment was made, though, shares of Monsanto were selling well below the $128-per-share cash offer on the table. It would seem that, if this deal were to go through, Berkshire's purchase was a short-term one poised to take advantage of the market mispricing an asset. If the Bayer-Monsanto deal does fall through, perhaps this will be a stock Buffett hangs on to. After all, Bayer will have to pay a $2 billion break-up fee to Monsanto if the acquisition doesn't close. So, either Buffett is sitting on a stock that will pay a decent cash premium once it gets bought or he hangs on to a company with a decent injection of cash and a strong pipeline of products feeding a must-have industry. Sounds like a win-win situation for Berkshire. Daniel Miller (Axalta Coating Systems): When investors think of a typical stock Warren Buffett would buy, some of the factors that come to mind are consistent revenue growth, competitive advantages, and long-term catalysts. 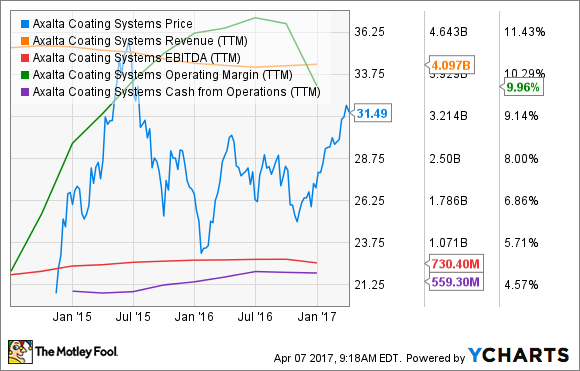 While it's tough to pick a bad stock within Buffett's portfolio, Axalta Coating Systems fails to achieve many of the aforementioned factors. Axalta is a coatings and finishing manufacturer focused on the automotive industry. The company provides a range of performance and transportation coatings for manufacturers of light and commercial vehicles and for collision repairs. The problem, though, is that the company's refinishing business -- which generates roughly 60% of its profits -- could be facing major risks over the long term. If we've learned anything in the automotive industry within the past 18 months, it's that autonomous vehicles are coming as fast as technology allows, with the futuristic goal of making car collisions, and thus Axalta's refinishing business, a thing of the past. That's just the long-term headwind, and unlike most companies that can boast of global growth stories through emerging markets, it's the opposite with Axalta, because as emerging markets become more developed, collision rates decline. On the other side of Axalta's business, supplying coatings for automakers' new light vehicles, the automakers have leverage with massive fleet sizes, which could pressure margins both sooner and later. Already, there are instances of automakers splitting what typically takes four coatings between multiple suppliers to drive prices lower and encourage competition. As you can see in the chart below, Axalta is far from a thriving growth story, and it faces serious secular headwinds over the long term -- this might be a stock Buffett soon decides isn't living up to his standards. Rich Duprey (Wal-Mart): Maybe it's too easy to pick Wal-Mart since Warren Buffett is already selling down his stake, but with almost 1.4 million shares left in his portfolio valued at around $100 million, it might make sense for him to completely jettison the whole thing. Wal-Mart has performed appreciably better even as the Oracle was selling down his holdings, going from 13 million shares at the previous report to the current level (Buffett had amassed over 60 million shares back in 2014, but he's been selling it down ever since). In its last financial report, Wal-Mart beat analyst earnings expectations by a penny but fell short on revenue thanks to food price deflation and foreign currency exchange rates. Its e-commerce business also showed marked improvement, with sales rising 29%, but it's had to spend heavily on making acquisitions, such as its $3 billion purchase of Jet.com, to make a dent. And Amazon.com is still the heavyweight in this business. That's likely why Wal-Mart decided to eliminate shipping fees on orders over $35, down from $50. It is trying to compete more directly with the e-commerce king, but the moves are going to come at a cost to margins. It's not going to get any easier going forward, and it will only become more cutthroat as the two compete in more and more arenas. The e-tailer's new Amazon Cash program, allowing those without a bank card to use cash to shop on its site, is yet another assault on Wal-Mart's dominance. When it comes down to it, the Wal-Mart holding won't make a big difference in Buffett's porfolio one way or the other since it's gotten so small, but since it has diminished so much that it now comprises just 0.06% of the total, there doesn't seem to be much reason to hold on to the remainder.